You can use many of items in several spaces, so they are really functional. I will provide you 13 references what it‘s worth buying out of this shopping mall. 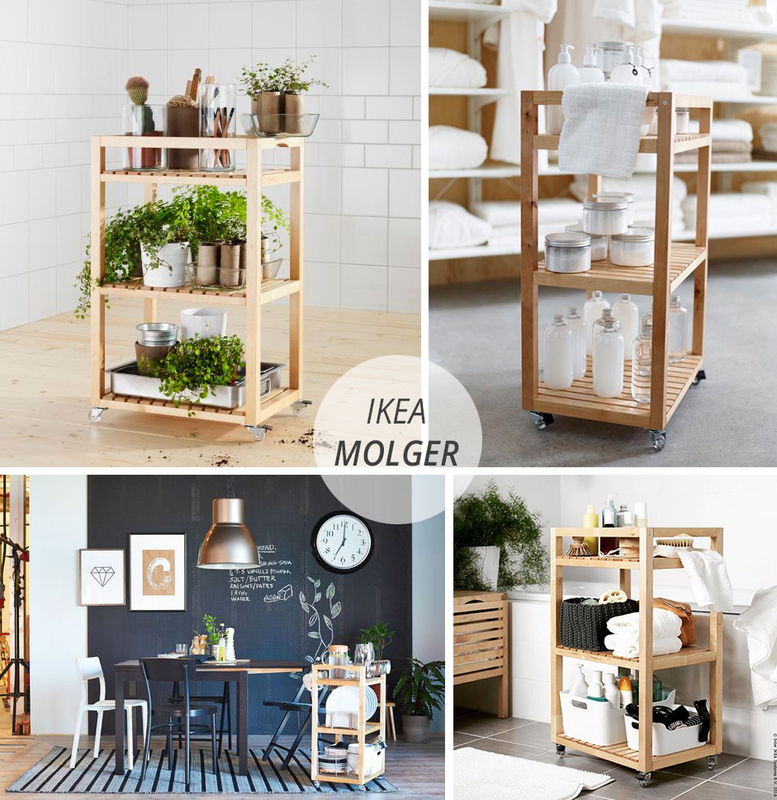 That‘s rather practical items that will perfectly fit in small spaces and I love small spaces! Or for those who rent the accommodation / students / or in general practical people. You can use a lot of items in several spaces, therefore, those who are looking for nice and functional items will not let themselves down. 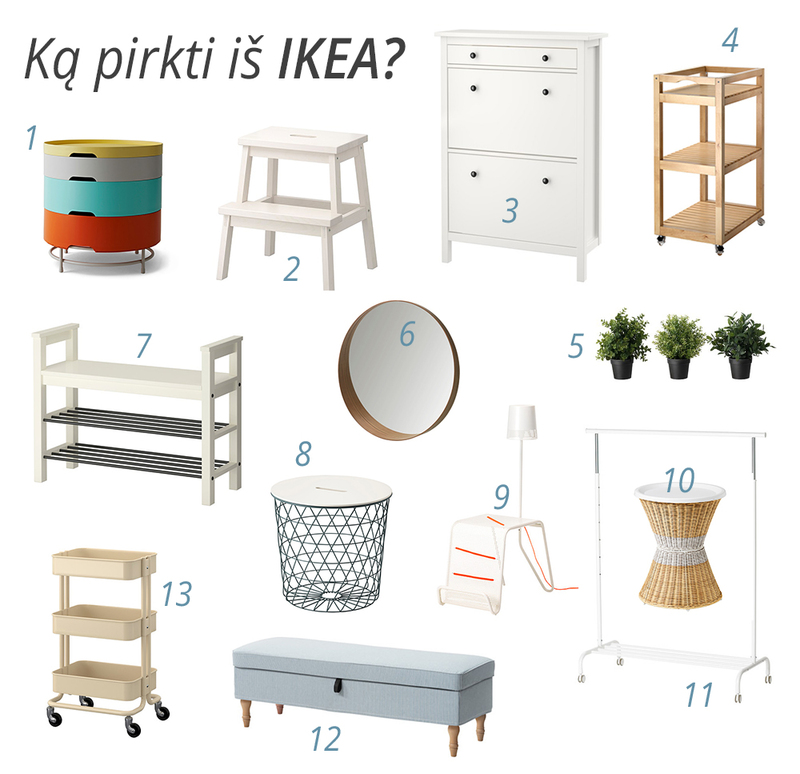 All items are from Lithuania IKEA website. A lot of sections to put the items never made damage – it can be kept next to a bed or in a place where a small table is necessary. In addition, that‘s a perfect colour accent. Usually in small kitchens cabinets are closed up to the ceiling, therefore, such step stool (or a simple chair) are necessary to reach the highest places. This stool would perfectly fit in a hall instead of a bench so that it was easier to put one‘s shoes on or instead of a night table. 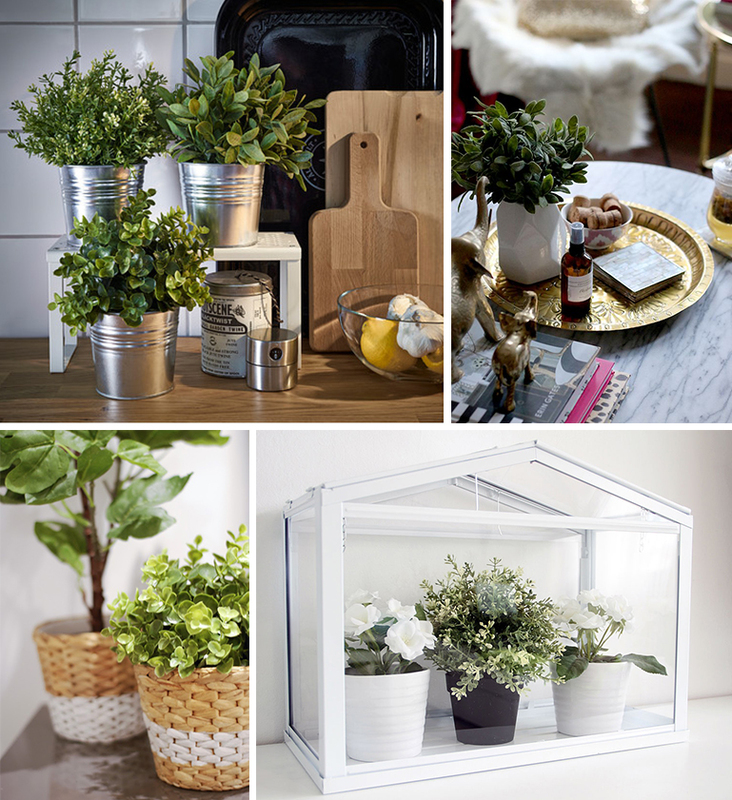 Even the plants can be put on it and we receive a nice plant space! Finally, such an item is necessary for the children who wash teeth or hands, as they still cannot reach washbasin. 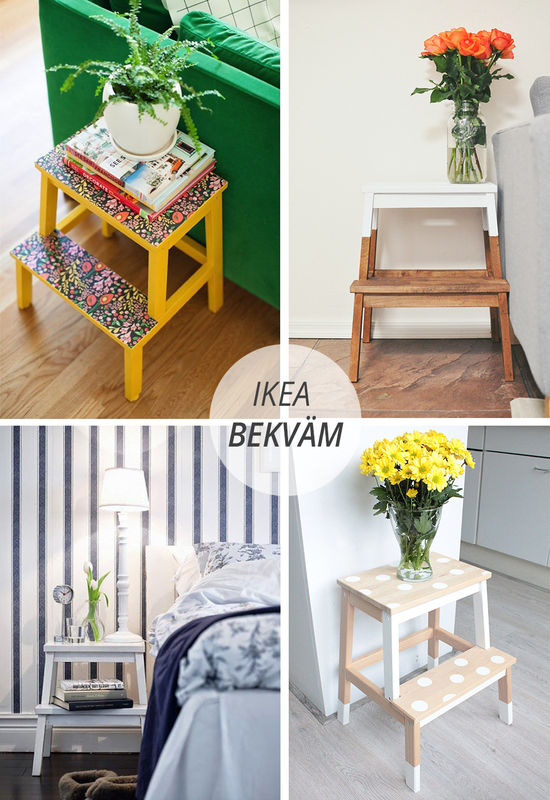 There‘re creative people who paint this stool in various colours, therefore, that‘s indeed a must have item from IKEA! 3. Narrow shoe cabinet. Link. That‘s a super piece of furniture for those in whose home there‘s a small hall. An always smart solution of small spaces is used here – to purposefully use the height. 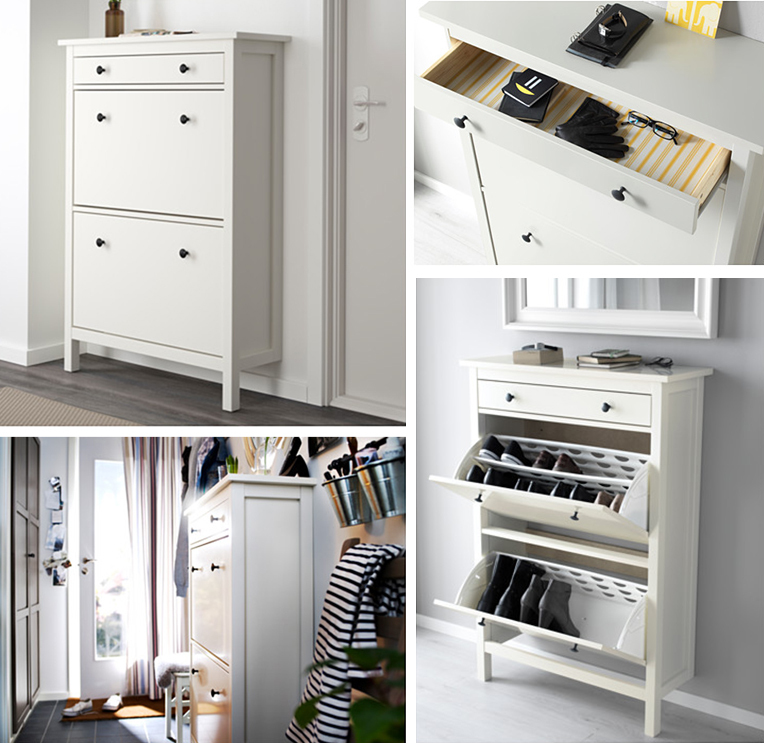 Such a cabinet will fit to any wall and will not disturb for walking, as it takes only 30 cm width! That‘s the width of a book shelf. Even though it‘s offered as the bathroom furniture, it definitely fits in any other space. 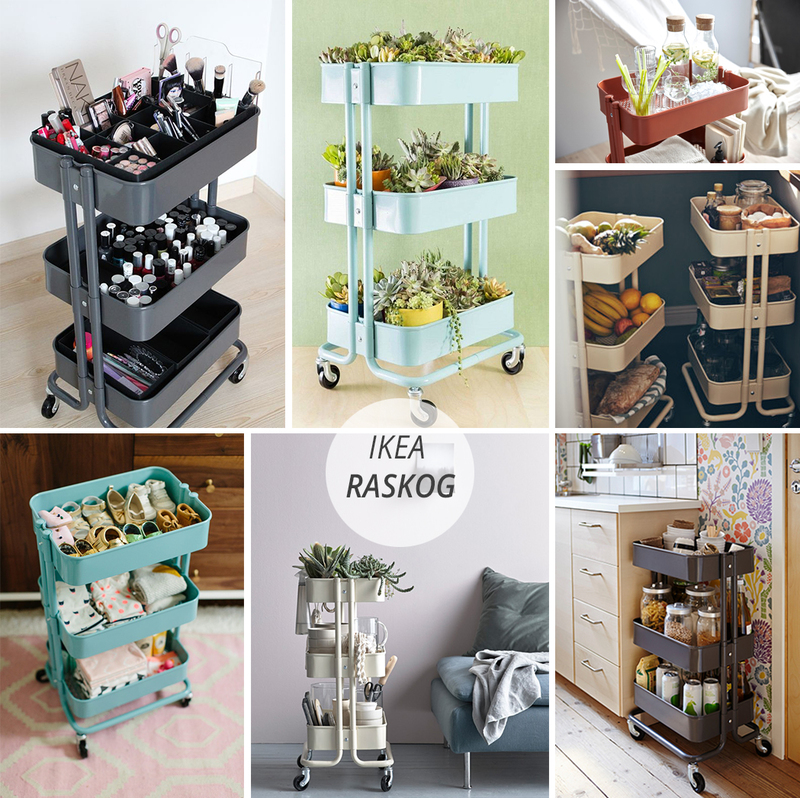 Such trolleys on wheels with several sections are very good contributors in a kitchen, next to a work table, in a bathroom or a bedroom. 5. Artificial potted plant. Link. A very good thing for those whose eyes want greenery but the hands do not want to pour anything and have nothing against artificial plants. I have them myself and I‘m very glad about this! They‘re especially suitable in dark places or in a bathroom where there‘s no daylight! I like this mirror very much...It‘s stylish, fits in a lot of spaces and plays the mini shelf role! 7. Bench with shoe storage. Link. If you don‘t make pieces of furniture in accordance to special orders and you want not to overload the space and have where to sit on and put your shoes – this shoe bench is indeed a good solution. One more rather solid piece of furniture, as it takes only the space of book shelf width. 8. Steel storage table. Link. One more solution that saves space. As it‘s written in the description of the product itself a lot of items can be kept in a basket: blankets, pillows, books, magazines or yarns. Or you can leave it empty and enjoy the space that‘s not overloaded. 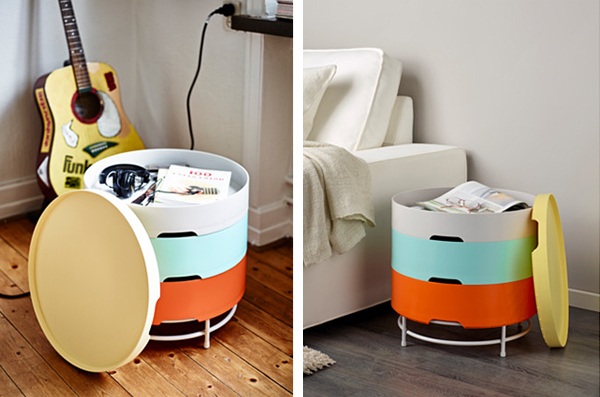 It‘ll be useful in a lot of spaces at home as: a coffee table, a night table or a magazine table. 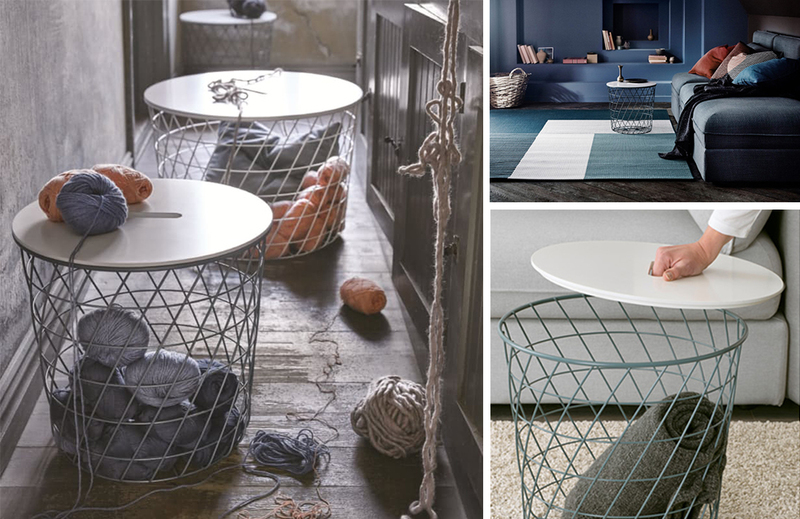 In addition, that‘s a piece of furniture that conforms the newest trends. 9. 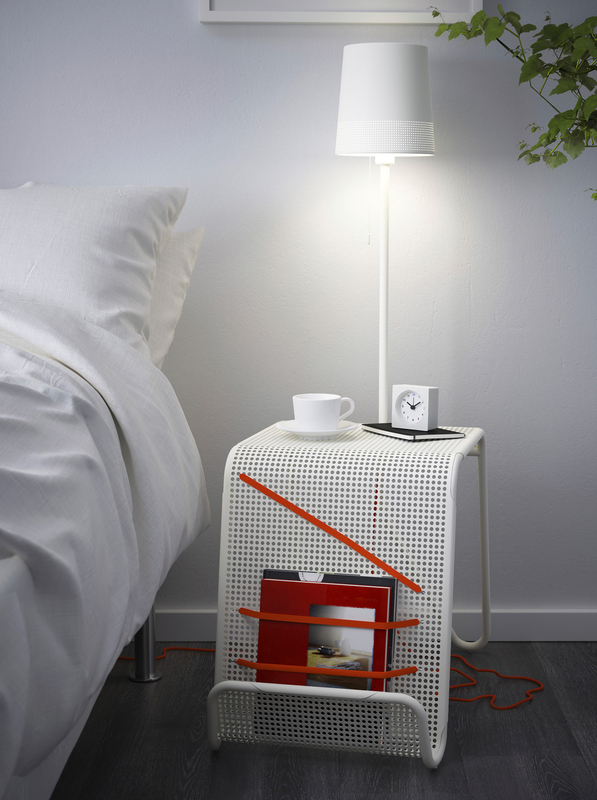 Side table with lighting. Link. You rent a flat or a room or you simply don‘t want to unmake electrical installation? The illuminator will travel everywhere where the table will – you‘ll only need a socket for this. An indeed comfortable solution next to the bed. Well, it‘s not indeed a night table. As a steel storage table it will perfectly fit in a guest room, as a coffee or side table and will function as the item box. There‘s some space for extension cords and chargers under postpones top. It‘s a real rescue when there‘re too little wardrobes. I also rescued myself with such clothes rack. It looks conditionally well, the place that‘s comfortable to change, it‘s spacious and stable. 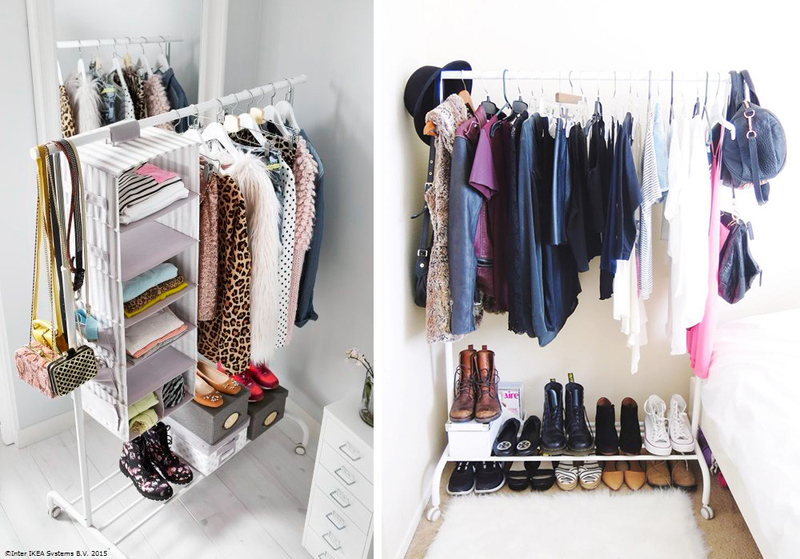 5 pairs of shoes would fit there and you can adjust the height of the rack as you wish. Only the best comments! 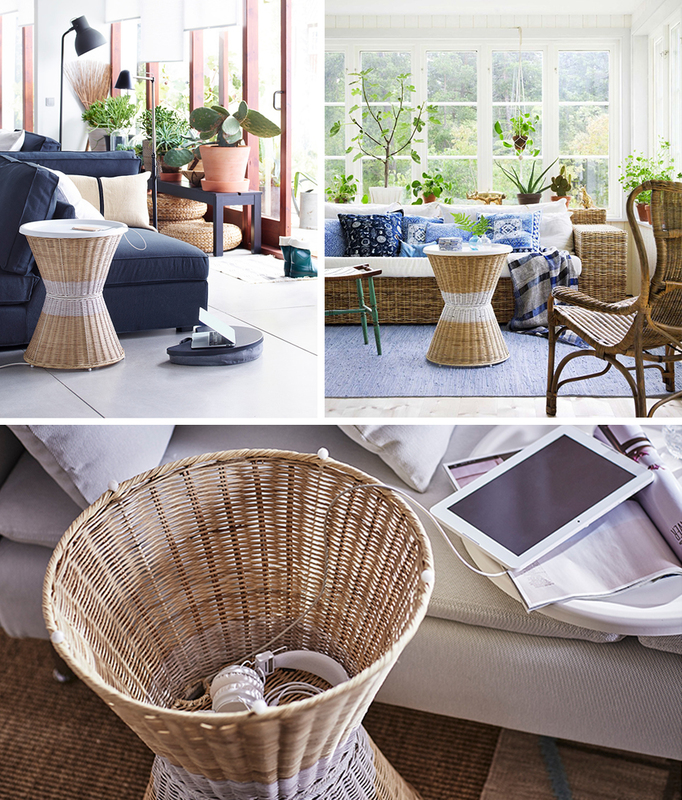 A perfect solution for the lovers of Scandinavian, Provence or even classical style. It fits best in a hall or in a bedroom behind a bed. The best thing - it can be opened, therefore, that‘s one more space for items without buying any other additional item. A huge variety of colours also charms. That‘s, I guess, the most popular trolley in the world. I‘ve seen endless number of examples. Everything‘s put on it – kitchen gadgets, drinks, various office tools, handworks, bathroom tools, plants, cosmetics, etc. In Lithuania somewhy only the ones of the colours cream, black and red brick are sold even though I think that the colours white, grey and green / in mint would come in useful.